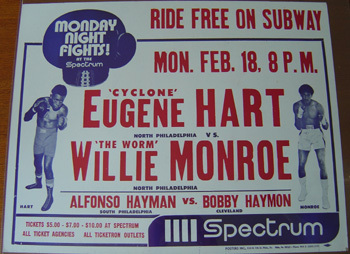 Willie 'The Worm' Monroe won a 10-round unanimous decision over Eugene 'Cyclone' Hart, on this day in 1974 before 10,127 Spectrum fans. The fight was one in a series of bouts that year among Philly's fine crop of young middleweight contenders - Monroe, Hart and Bobby 'Boogaloo' Watts. The round-robin produced the following results: Monroe W10 Hart, Watts KO1 Hart, and Watts W10 Monroe. Watts came away with the bragging rights, but Briscoe was still Philly's top 160 pound dog.